The big problem I had with the book is that it immediately got me off on the wrong foot. Rule # 9. If you’re out cycling in bad weather, it means you are a badass. Period. ‘Badass. Period’ Those two words alone are more painful than seeing a triathlete break up a chain gang by riding with tribars. My immediate reaction to those two words is to throw away the book in Shakespearian disgust. Whatever happened to the rules of the English language? Cycling terms are cool if they are in a European language. If they had translated ‘badass’ into Flanderian, I could have accepted it. But, if you want to speak American hip hop, take up a sport like Basketball, not cycling. American-Australian-English will never be the language of procycling, that’s my rule. If you have to speak in English, British English is good. Respect Shakespeare and Orwell. (As a tangent – Despite inventing the Dunlop tyre and many of the other key cycling inventions, Britain lost the way with cycling when we banned mass-start races (apparently motorists complained at the furious cycle racing). It left us with a curious set of rules about dressing up in black, turning up to races early in the morning and setting off at one minute intervals (so riders could claim they were not racing). 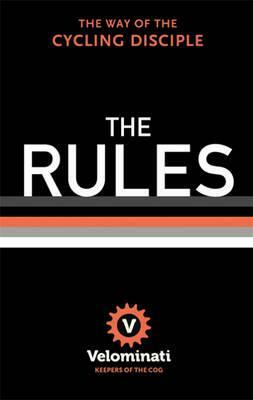 This created the whole sub-culture of UK time trials, with it’s own set of curious rules. But, as much as I love the sport of time trials, I have to admit that British time trialling on dual carriageways is not the spiritual essence of cycling. No matter how many Tours – Wiggins and Froome win, Pro-cycling will always be European. The classics of Belgium and Italy are the heart of cycling. Velominati get it right in promoting this European approach, but, it would be better without the American-English. Oh Dear. How many rules does this break? Rule # 13. If you draw race number 13, turn it upside down. If I could choose a number, I would always ask for 13, and I would never turn it upside down. You can call it my lucky number. Rule #24 Speeds and distances shall be measure in km not miles. I definitely support this. But, again, here I’m a sad failure. The chance of the UK Cycling Time Trials replacing the 10 mile time trial with 16.05 km time trial is close to non-existence. We like our standard distances here in the UK. It leaves us in limbo, my speedometers and cycling logs are an unwelcome mis=mash of km and miles. I’ve never been able to satisfactorily settle on one or the other. Rule #65 maintain and respect your machine. The more I cycle, the more I try to follow this rule. It does make a difference going out with a bike in clean and working order. I even like the little attention to details like the rules on tyres and wheel levers. This is something to aspire to. It also pains me when beautiful bikes are besmirched with mud, stickers and lack of attention. Though if you do maintain an immaculate bike, don’t forget to ride it. Rule #58 Support your local bike shop. Definitely good. Meeting real people who care about cycling and not the soulless internet. This is the cycling culture to encourage. If I may summarise the gist of other rules. Cycle training involves four hours plus, no food, one water bottle, Never get out of the big ring, It’s good to be cold, take the minimum of equipment, saddles bags definitely out. Longslow hard miles. Old school rules! Rule #101 Don’t mention the drugs! Omerta rules! Riders who took drugs are cool, so long as they didn’t try to get everyone to wear a silly armband for their cancer charity. I’m all rather biased. I’ve spent the last 20 years trying to find armwarmers which fit properly. Yet, no matter which brand I buy, my arms are too thin and the armwarmers fall down, leaving that exposed skin between jersey and armwarmer, thus breaking some cardinal rule. On the plus side, being built like a stick insect makes you a good climber, on the bad side, you can’t quite fit into those who deeply care about aesthetics. At the end of the day, I suppose I’d rather be a good climber. I would recommend buying the book. It’s a good read. There are times, when you wonder whether they are actually being serious or it’s all some strange sense of humour. On the one hand, I’m being more careful about how I tighten up my wheels, I do want it to be correct. Also, I hope many people will read this book and improve their cycling aesthetics. It is nice to see a rider really taking care of his bike, clothes and machine. It faintly annoys me when amateurs simultaneously wear World Champion jerseys, yellow wristbands, and the number from their past 50km cyclo sportive. But, on the other hand, I’d love to tag along the back of their Velominati group ride then try to drop them on a headwind climb helped with a set of tribars. I just can’t decide whether to be a disciple of the rules or make up my own. One thing I would say is that it’s very good if other people follow all these rules (not least because I’d have a better chance of winning cycle races if my competitors training involves 4 slow hours without any food). But, I fail on over 50% of the rules. It’s just one club I can’t be in. Finally, I love the magic and allure of European pro-cycling, but, at the same time I hate the perverted morality of the peleton which created and maintained the omerta. It makes you want to break a few rules just to annoy them. Wear number 13 the right way up, that’s a start. Nice review. Pretty much sums up where I am at with the rules too. They are mostly a bit of fun, and anyone really bashing on about any of them beyond it being fun is probably a bit daft. But, there is also some truth in them. I honestly think I do ride a bit harder when I think I look that part, which in a lot of ways, means looking a bit ‘pro’. 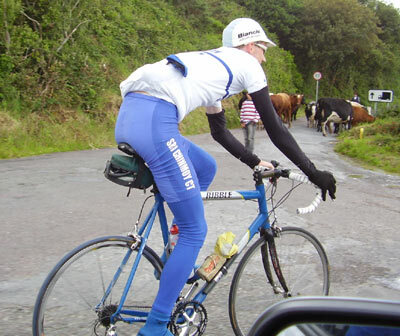 So, knee warmers, yes. Arm warmers with not gaps, yes (sorry Tejvan). I do feel proud for being ‘badass’ (suggest the word “frondeur” as a suitable replacement: of French origin meaning ‘rebel’) when cracking a good ride in awful weather.